Prepare For a December Rate Hike? Companies added new jobs in October at the fastest pace of 2015, knocking the U.S. unemployment rate down to a seven-year low and setting the stage for the Federal Reserve to raise interest rates before the year ends. The economy generated 271,000 new jobs last month, with all but 3,000 coming in the private sector, the government said Friday, topping the MarketWatch-compiled economist consensus for 180,000 jobs created. 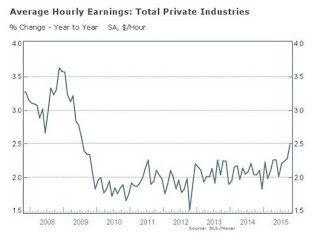 Almost every major industry boosted payrolls. Just as important, a long-awaited acceleration in wages might finally be happening. 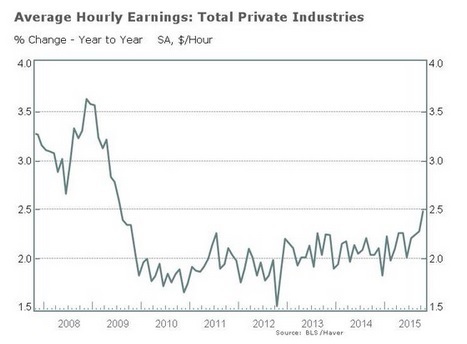 Hourly pay rose at the fastest year-over-year pace since the U.S. exited recession in mid-2009. Economists have been expecting a faster increase in pay amid a deep drop in unemployment and the creation of millions of new jobs over the past several years. The unemployment rate, meanwhile, fell to 5% from 5.1%, marking the lowest level since April 2008. More people also entered the labor force in search of work, a sign that jobs are available. The sharp rebound in hiring last month eases worries about a softening labor market after job creation suddenly slowed in August and September. Employment gains were a combined 12,000 higher in those two months than previously reported, the Labor Department said. The latest employment report offers concrete evidence the U.S. remains on a solid growth path despite turmoil in the global economy and tougher times for some domestic industries such as manufacturing and energy. The Fed is prepared to raise its benchmark short-term rate for the first time since 2006, and the October jobs report will likely bring policy makers to the precipice. Top officials won’t meet again until after the November jobs report, however, so the Fed can wait for more confirming evidence. Stock futures soured after the report, while yields on Treasurys climbed. The rebound in hiring in October was driven almost entirely by companies that offer services such as software design, banking, health care, shopping and eating out. White-collar businesses added 78,000 profession jobs. Health care added 45,000 positions. Retailers took on 44,000 new workers, and restaurants hired 42,000 people. Builders also beefed up employment by 31,000, reflecting an upturn in construction over the past year. The only two industries that continue to struggle are energy and manufacturing, reflecting the diverging fortunes of companies that produce goods and those that offer services. Export-intensive manufacturers that make goods such as heavy machinery and companies that extract fossil fuels have been battered by a strong dollar and plunging oil prices. Employment in the manufacturing sector was unchanged in October, and energy producers cut jobs for the 10th month in a row (click on image). The labor market as a whole, however, is still the healthiest it’s been in years. 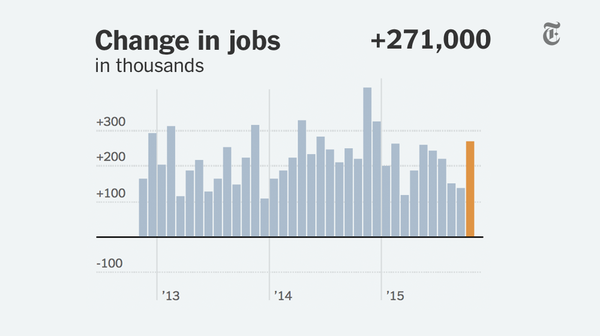 The U.S. has added an average of 206,000 jobs a month in 2015. As a result, the number of people who can’t find work or who can only get part-time jobs continues to shrink. The so-called U6 unemployment rate that takes these people into account dropped to 9.8% in October, the first time it’s fallen below 10% since May 2008. 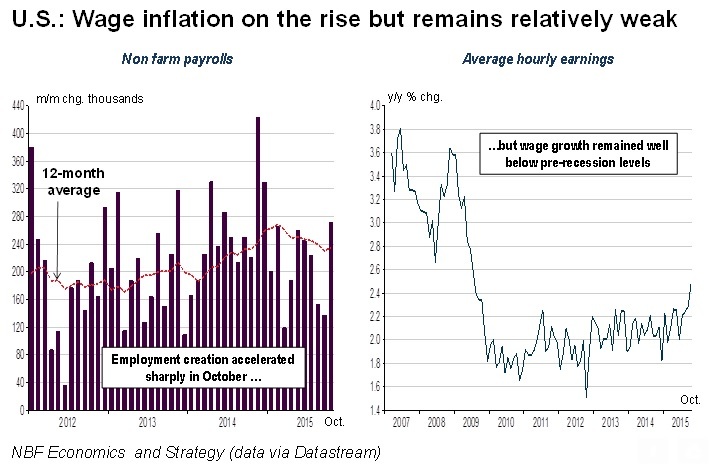 The labor market is still not fully healed, however. Some 15.6 million Americans who want a full-time job can’t find one, an unusually high number after more than six years of economic recovery. The percentage of able-bodied people 16 or older in the labor force also sits at a 42-year low. The labor force participation rate was unchanged at 62.4% in October. 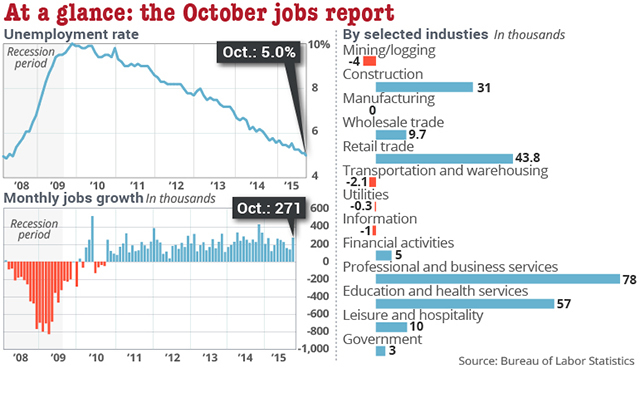 The October jobs report was a monster, far exceeding the expectations of economists. It also raised the expectations that the Fed is going to go ahead and raise rates for the first time in a decade in December. The American economy added 271,000 jobs in October, the government reported Friday, a very strong showing that makes an interest-rate increase by the Federal Reserve much more likely when policy makers meet next month. The unemployment rate dipped to 5 percent, from 5.1 percent in September. Average hourly earnings also bounced back, rising 0.4 percent in October after showing no increase in September; that lifted the gain to 2.5 percent over the last 12 months, the healthiest since 2009. The combination of the surge in job creation, rising wages and the falling unemployment rate all increase the pressure on the Fed to finally move on rates after months of debate and uncertainty amid economic turmoil overseas. It also largely puts to rest any lingering fears of a new recession and suggests that the economy is likely to continue to improve as the nation heads into an election year. At 5 percent, the unemployment rate is very close to what would normally be considered the threshold for full employment by the Fed and many private economists. The slack that built up in the labor market after the recession, however, has altered traditional calculations of how far unemployment can fall before the job market tightens and the risk of inflation rises. The proportion of Americans who are in the labor force, which fell to a 38-year low of 62.4 percent for September, was unchanged last month. This week, Janet L. Yellen, the chairwoman of the Fed, told a panel on Capitol Hill that an increase in December was a “live possibility” if the economy continued to perform well. Ms. Yellen left herself and the rest of the Open Market Committee of the Fed plenty of wiggle room, emphasizing that no decision had been made on whether to raise rates for the first time in nearly a decade. They will have an additional jobs report for November in hand by the time they gather for their last meeting of the year, on Dec. 15 and 16. But the surprising strength of the economy in October puts the Fed on track to finally bring to an end an eight-year period of near-zero interest rates. Although the initial interest rate increase would be small, most likely a quarter of a percentage point, any increase would represent a new era for investors and borrowers here and abroad. The Labor Department’s broadest measure of unemployment, which includes workers forced to take part-time jobs because full-time work is unavailable, fell to 9.8 percent in October from 10 percent in September. A year ago, it was over 11 percent. With the strong October data, economists are already beginning to look beyond the first move to the question of how fast the Fed will have to make subsequent rate increases if the labor market continues to tighten. Before the report on Friday, economists had been anticipating a payroll increase of about 180,000 jobs, with the unemployment rate remaining unchanged from September’s level. The Labor Department revised upward the total number of jobs created in August and September by 12,000. The picture of labor market strength evident in the data sent bond yields surging in the minutes after the release of the report, as traders rapidly adjusted for the likelihood of a December move. Although a small proportion of total employment, manufacturing has been one source of weakness, losing more than 25,000 jobs over the summer amid softening demand from Asia and other export markets. The mining and logging sector has also been shedding jobs, cutting more than 100,000 positions this year as prices of oil, iron and other commodities have plunged. Still, many other areas of the economy — like professional and business services, health care, and leisure and hospitality — have been very strong, with employment in each of those three sectors increasing by more than 30,000 jobs in September. 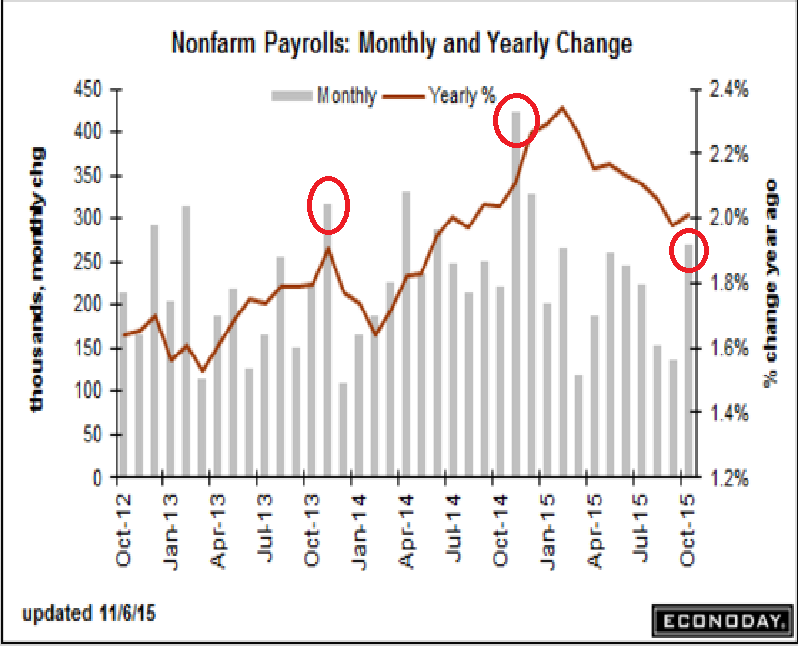 The pattern persisted in October: Factory jobs were unchanged, while mining and logging lost 4,000 positions. Professional and business services, meanwhile, recorded a huge 78,000 increase in jobs. Health care hiring was also robust, with a 56,700 increase. White-collar employers like Ernst & Young, the accounting and consulting giant, have been on something of a hiring binge. Over the course of the company’s 2016 fiscal year, which began in July, Ernst & Young plans to hire just over 17,000 new employees in the United States, with roughly 10,000 joining straight out of college. In July, August, and September, the firm added 2,500 more experienced accountants and consultants, said Dan Black, director of recruiting for the Americas. “Whether it’s dealing with taxes, regulations or technology, our clients want help,” Mr. Black said. Nearly all the positions, whether entry-level or for more experienced workers, require at least a bachelor’s degree, underscoring how crucial credentials and specialized skills have become in today’s job market. Starting salaries for holders of newly minted degrees in fields like accounting, finance and computer sciences frequently range above $50,000 or $60,000, Mr. Black said. Veteran workers in hot fields like cloud computing and cybersecurity can command much more. Indeed, it might be a dogfight for experienced talent in white collar fields but I would temper my enthusiasm on this latest jobs report and wait to see a series of higher than expected employment gains before concluding wage inflation is a serious concern. After a disappointing third quarter, which saw the smallest net job creation in three years, the US labour market got its mojo back. 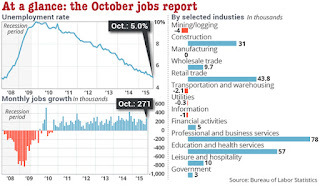 At least that the message sent out by October’s consensus-topping employment reports. 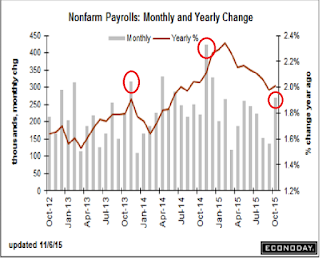 The establishment survey not only showed a mind-blowing 271K increase for non-farm payrolls, the biggest increase this year, but also the best diffusion of private sector jobs in months, i.e. job gains were broad based. Also encouraging is the fact that state government employment was up again which means public finances are on the right track, i.e. a positive for the implementation of much-needed infrastructure projects. In other words, the observed surge in construction employment has room to run. 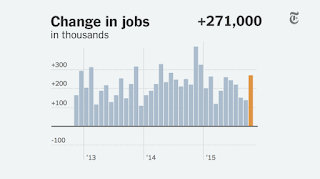 Similarly, the household survey, in addition to showing the largest increase in jobs since January and the lowest unemployment rate in seven and a half years, also put full-time employment at a record 122 million. All in all, the stellar employment reports will likely convince the FOMC to raise interest rates in December for the first time in nine years. But that’s not to say the Fed is about to embark on a tightening cycle à la 2004-06. The strong dollar raises risks for the US economy next year with regards to both growth and inflation, the latter already far below the Fed’s target. Also, despite appearances, not all is rosy the labour market. 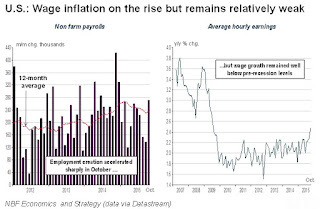 As today’s Hot Charts show, wage inflation, despite rising slightly in October, remains well below pre-recession levels capped in part by weak productivity gains (click on image). "Before going to bed last night, I calculated that any jobs number over 150,000 would be sufficient. And I think importantly because the Fed views the economy and future inflation through a Taylor Rule and a Phillips curve lens that speaks to low unemployment and a new NARU that somewhere around 5.25 percent, which is now below that at five percent." 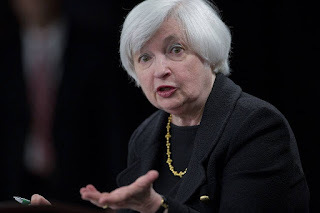 "I think the Fed fears it…They took it out of their statement last month. But prior to that, they were cognizant of the fact that a very strong dollar has negative implications for emerging markets… It’s certainly a negative for the global financial system because there are many bets and much dollar denominated debt in terms of emerging market corporations and sovereigns will be impacted by this." I'm not going to get all technical on you but from a fundamental perspective the strength in the USD doesn't surprise me. The U.S. economy is recovering nicely while the rest of the world is languishing, especially in the euro zone where German factory orders plunged the most since 2009, underlining the risk of a slowdown in Europe’s largest economy. I've been warning my readers of the euro deflation crisis and having just visited the epicenter of this crisis, I came away convinced that the euro will fall further. In fact, I wouldn't be surprised if it goes to parity or even below parity over the next 12 months. There will be countertrend rallies in the euro but investors should short any strength. What is my thinking? First and foremost, the European Central Bank (ECB) is falling way behind the deflation curve. Forgive the pun, but as long as Draghi keeps dragging the inevitable, meaning massive quantitative easing, the market will continue pounding the euro. The fall in the euro will help boost exports and more importantly, import prices, fighting the scourge of deflation. Once the ECB starts ramping up its quantitative easing (QE), there will be a relief rally in the euro and you will see gold prices rebound solidly as inflation expectations perk up. This is counterintuitive because typically more QE means more printing which is bearish for a currency -- and longer term it will weigh on the euro -- however over the short-run, expect some relief rally. But the problem is this. You can make a solid case that the ECB has fallen so far behind the deflation curve that no matter what it does, it will be too little too late to stave off the disastrous deflation headwinds threatening the euro zone and global economy. Now, if you ask me, there is another reason why the USD is rallying strongly versus all other currencies and it has little to do with Fed rate hikes that might come sooner than the market anticipates. When global investors are worried about deflation and another crisis erupting, they seek refuge in good old U.S. bonds. This has the perverse effect of boosting the greenback (USD) and lowering bond yields, which is why I'm not in the camp that warns the bond market is more fragile than you think. What does the strong USD mean for the U.S. economy? It means oil and import prices will drop and exports will get hurt. Ironically, lower oil and import prices will reinforce deflationary headwinds, which isn't exactly what the Fed wants. But the stronger USD might also give the Fed room to push back its anticipated rate hikes. Why? Because the rise in the USD tightens up financial conditions in the U.S. economy, acting as a rate increase. I might have been off on gold which has lost its luster but I was bang on the euro weakness and think it will continue its decline over the next year or two. The more important point here is whether a monster jobs report will be enough for the Fed to hike rates in December or keep it on the sidelines if the mighty greenback keeps soaring. I raise this issue because I maintain there is no end to the deflation supercycle and that the stronger U.S. dollar will only make the Fed's deflation problem worse, especially after China's Big Bang, raising the specter of deflation coming to America. Now more than ever, the risks of the Fed making a monumental mistake by raising rates prematurely are what concerns me going forward. In a CNBC interview shortly after the Labor Department released the jobs report, Evans said the data support his 2016 economic outlook of 2.5 percent growth. Addressing whether the Fed should hike interest rates next month, the dovish Fed official acknowledged, "We've indicated that conditions look like they could be ripe of an increase." "[But] my continued preference for more delay or a shallower path ... [is] my uncertainty over whether ... inflation is going to get up to our 2 percent objective within reasonable amount of time," he said on " Squawk Box ." He added he's also a "little bit worried about downside risk with the weak foreign economy." Evans, a voting member this year on the central bank's policymaking panel, wants financial markets to focus on the path for rates, not the exact timing of the initial move. The Fed needs to have communications that "indicate the path is going to be gradual," he said. Evans's remarks echoes those of Atlanta Fed President Dennis Lockhart who on Thursday told the Joint Central Bank Conference in Bern, Switzerland, he still believes the ongoing economic recovery means an interest rate hike soon but stated a rate liftoff remains a 'close call'. I've recently argued there's a sea change going on at the Fed and that data dependent means they're increasingly looking at foreign economies and how they impact U.S. inflation expectations via the U.S. dollar. Remember, according to the last Fed minutes, Federal Reserve officials held off on raising short-term interest rates at their September policy meeting because of worries that inflation could remain stuck at exceptionally low levels. Will the latest jobs report be enough to ease the Fed's deflation concerns? That remains to be seen but keep your eye on the mighty greenback because if it continues rising from now till the Fed's December meeting, we might be in store for a December surprise. It seems unlikely that the dollar could move far enough over the next month to derail a rate hike. U.S. inflation is not that sensitive to the currency, so it is unlikely that any plausible moves in the currency would move the inflation rate by enough to worry the Fed. Even if the dollar moves, financial market price changes can rapidly reverse; we saw that with equities many times over the past few years. The Fed needs to ignore financial market volatility. Dollar problem now has company (which was not the case during summer deluge): The entire US yield curve backing up aggressively. There will be no hike in December with follow through in all of the above. As far as stocks and bonds, go back to read my comment on the October surprise as my thinking hasn't changed much since then. You'll notice that financials (XLF) took off this morning following the jobs report but traders are selling that bounce a bit. Sill, big banks like JP Morgan (JPM), and Goldman Sachs (GS) rallied sharply on Friday. Bonds (TLT) sold off and the 10-year Treasury yield hit 2.35% Friday morning but I wouldn't bet on the bond bubble bursting anytime soon and think large institutions, including large and obscure hedge funds, are scooping up bonds at these levels. 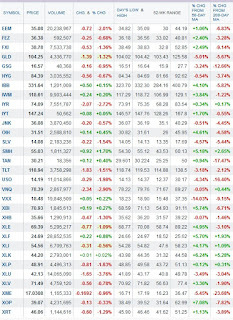 Not surprisingly, emerging markets (EEM), Chinese (FXI), Energy (XLE), Metals & Mining (XME), Utilities (XLU), REITs (IYR), Homebuiders (XHB), and Retailers (XRT) are all down today as they are sensitive to any rise in rates and the U.S. dollar (which crushes commodity prices and hits emerging markets hard, increasing global deflationary headwinds). Below, Bill Gross says there is a "100% chance" the Fed will raise rates in December. It sure looks that way but keep your eye on the mighty greenback as we head into December because if it keeps rising relative to other currencies, the Fed might delay any rate hike till next year. Also, Chicago Fed President Charles Evans, weighs in on the next FOMC meeting and the likelihood of a rate hike in December. Listen to his comments on the path of rate increases and especially his comments on inflation expectations. Lastly, Bank of England Governor Mark Carney discusses interest rates and the economy with Bloomberg Editor-In-Chief John Micklethwait. Listen carefully to his comments on how emerging markets are concerning him. Once again, please take the time to donate or subscribe to my blog and show your support in bringing the very best insights on pensions and investments. You can do so using the PayPal options at the top right-hand side of this page. I thank all of you who are supporting my efforts and look forward to seeing others join them. Elite Funds Prepare For Reflation? A Bad Omen For Private Equity Returns? AIMCo Investing in Renewable Energy? The Caisse's Big Stake in Bombardier? Forcing Green Politics on Pension Funds? Ontario Pensions' Fossil Fuel Disaster? 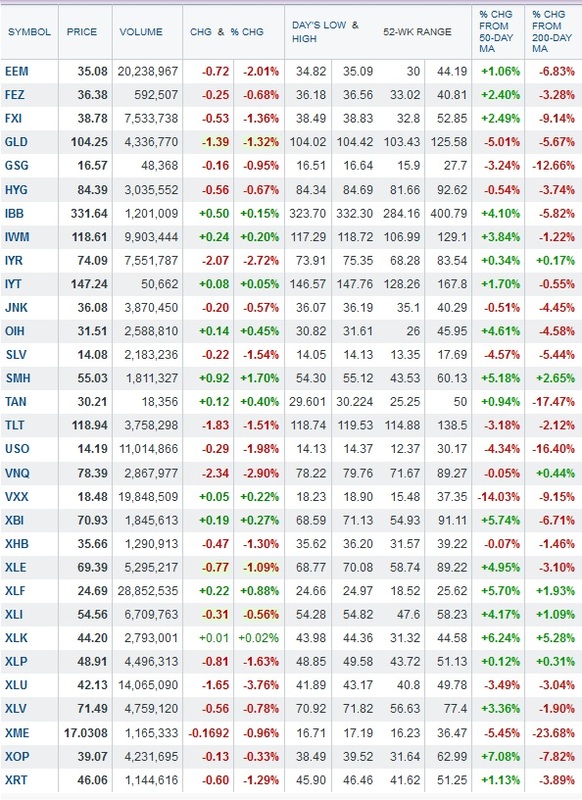 What's Spooking Markets This Friday The 13th? CPPIB's Chair On The Hot Seat? 2015 Hedge Fund Bets Gone Awry? Pension Fix By Congress Could Backfire?